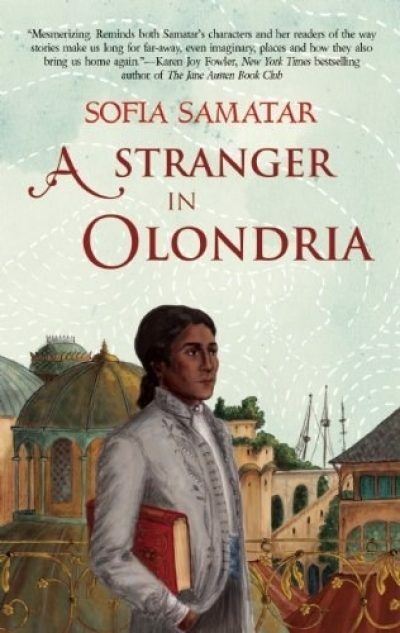 2013’s A Stranger in Olondria was Sofia Samatar’s debut novel. Jevick lives far from Olondria. Son of a wealthy pepper merchant living in the backwater Tea Islands, Jevick’s life is transformed when his father decides to hire a tutor for his son. The merchant values education without respecting it, and has little idea that exposure to the world of letters will radically affect Jevick. seduced by the rich cultural life of that city. And why not? Olondria offers so many lovely distractions. It is to be hoped that Jevick enjoyed them thoroughly, as he didn’t have all that long to savour his new life. Jevick’s kindness to a dying girl he met on the way to Olondria makes him the logical person for her ghost to ask for help. She has died without a proper burial and cannot rest until this is done. You’d think that the priests would know just what to do but … Jevick lives in an era that no longer believes in ghosts. He is diagnosed as mad, and confined. Escape from confinement may be possible. Escape from his invisible companion will be rather more difficult. I generally put my negative comments first, followed by a rambling list of the stuff I liked. I am having trouble applying that model to this book, because there’s not much about it I don’t like. Well, I am not crazy about the cover art. I don’t hate it, but I don’t love it. A considerable part of this book is about the wonder of learning to read and gaining access to new worlds of knowledge and story. This may resonate for people who can actually remember life before they could read. I do not. There must have been a time when I could not read, but I no longer remember what that was like. Because I learned to read quite early1, around the same time I learned to speak, and because my many head injuries have rendered large swathes of my past conjectural. Samatar’s exquisite prose is something I can appreciate. Although apparently not discuss articulately. I am not the only one to enjoy this novel; it won the William L. Crawford Award, the British Fantasy Award and World Fantasy Awardand was nominated for a Nebula Award. I am not entirely certain on which, if any, real world models Samatar based her secondary world but it’s safe to say they were not the threadbare knock-offs of medieval Europe embraced by too much extruded fantasy product. Her world is considerably more equatorial and civilized; it is a world with long-established trade routes and cosmopolitan tastes. I don’t think it’s quite the great Srivijayan secondary world fantasy I hope to read some day, but it is as close as I have ever come to it. A Stranger in Olondria is available from Small Beer Press. 1: I do recall my father reading me part of a story and telling me I could find out how it ended if I learned to read. Seems to have worked … except that I no longer remember any of the story, not even the title or theme.